Need the answer quickly? Skip past my rambling to see it. Registers + teachers = problems. This is a universal calculation that I’m working on, and so far, it’s holding well. For the best part of this Spring term, the IT team where I work (myself and one other person) have been going into the form rooms and making sure that staff complete their registers. This has been quite a bit of effort, as most of the time the excuses have been “I didn’t know I had to press save by 8:35” or “I haven’t pressed save as not all of the students are here yet“. As the registers have gradually started to get completed correctly, we stepped down our checking. It had been a while since the last check on how well the registers were being completed, and out of interest I popped into the reception office this morning to have a check. It didn’t look good. While the receptionists assured me that the registers have been completed without problems for the last few weeks, only 3 out of 16 had been filled in today. To be fair, I waited around for a few minutes just in case the staff were a bit slow on pressing the save buttons. By 8:45 still no more registers had been filled in, which was very unusual. However, we have paper registers as a fallback if there’s a power failure (none of these had been returned) and the receptionists were able to access the “edit marks” section in SIMS to fill in any students who were to be marked as ill from their parents calling in, so nothing flagged up as a major problem. 8:55 and around came the end of registration. Still no more were filled in. One staff member came in with a paper register, and mentioned that they had a problem trying to fill in the register. After describing that it was a SIMS fault window that was opening, and me telling them they should just close SIMS and open it again, they said they had and the same problem happened. I said that I’d have a look at it as SIMS on that computer had probably just become corrupted. Thanking them, the next member of staff came in and reported the same problem of the registers crashing on opening them. One person having a problem is fine, two with the same problem leads to investigations. I fired up SIMS on one of the computers and tried to access the registers. 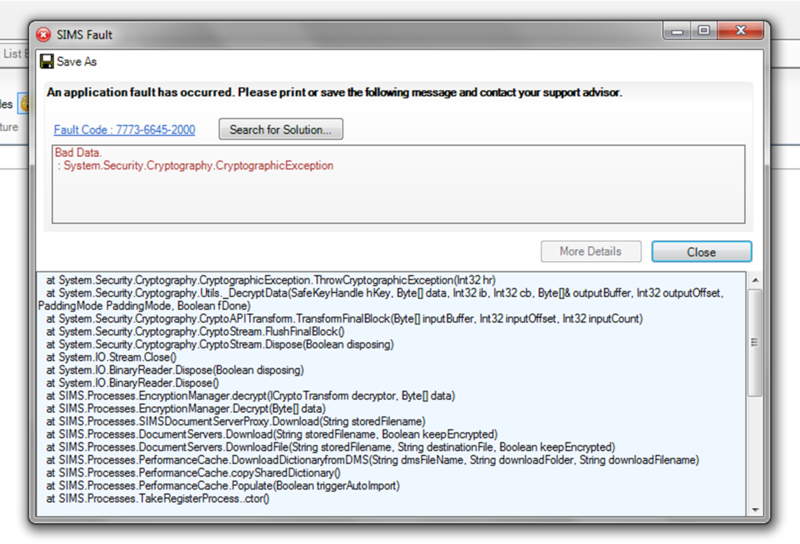 It immediately crashed, reporting “Bad Data – System.Security.Cryptography.CryptographicException“. Then the rest of the staff came in one big group to hand in their registers. After hearing “SIMS wasn’t working” 11 more times, and concluding that the problem wasn’t a simple fix, I got on to calling Capita. After explaining the problem, the guy on the other end put me on hold to see what could be causing it. A few minutes later he said that there was a fix and he could email me it over, and then ended the phone call by saying “thanks Joseph“. I didn’t mind the informality, but that isn’t my name! Also, the speed in which he found a solution implied that this might be quite a common problem? After applying the fix, SIMS was back up an running again, and all staff could start screwing up filling in their registers again. I’ve decided not to check on how well the registers are being filled in again, as I either caused the problem by asking about them, or have some super human sixth sense that lets me know when there’s going to be problems with computers. Either way, I don’t really want to find out. Note: These steps worked for me.They are here as a quick lookup, and I do not provide them with any warranty or for them to be fit for purpose. If you screw something up, it’s your fault. If in doubt, just do step 7. Posted in Management Information Systems. Tagged SIMS.net. Next: Next post: I Wonder if there’s a Problem?